"Sampath Speaking" - the thoughts of an Insurer from Thiruvallikkeni: Corey Anderson hits.... million dollar catch .... Tui way ..
Corey Anderson hits.... million dollar catch .... Tui way ..
DB Breweries is a Singaporean and Dutch brewing company operating in New Zealand. It was founded in 1930 by Sir Henry Kelliher and W Joseph Coutts. 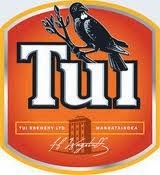 Its TUI brand is one of the better-known beers in New Zealand, partly due to strong advertising. In grounds of SA, Australia, New Zealand, you can see people sitting relaxed manner having beer……everytime, you enter Chepauk stadium, you are body-frisked – in earlier days, the security would open the cool-drinks bottle and smell it…. Cola drinks would not be allowed inside – for they could have been mixed with alcohol. NZ dollar trades around 51.62 rupees and $100000 = Rupees 51.62 thousand ~ in last IPL auction, Glenn Maxwell was the surprise buy ! Corey Anderson is the fast emerging star….recently against the visiting West Indies - Anderson, finished unbeaten on 131, took 36 deliveries to reach his century ~ in the process made history - beating the previous record set by Shahid Afridi. The burly New Zealander hit 14 sixes, the third highest in an ODI innings behind Rohit Sharma (16) for India against Australia two months ago and Australia's Shane Watson (15) against Bangladesh in 2011. Before you could think of anything else, the savaged opponent Captain Dwayne Bravo predicted a million-dollar future for the the 23-year-old from Christchurch and wished to see him as a fellow Super Kings in the coming Indian summer. “I hope the right people are watching him,” Bravo said. Dhoni and our men have not yet seen that blitzkrieg but have witnessed the man smashing a 40-ball 68 on Sunday to set up a daunting 293-run target. Anderson, then, returned to take two crucial wickets to set up a 24-run win. At Hamilton, he made an Indian very happy. Not the present bunch of players …. One man has seen him early… the run scoring Virat Kohli when he captained India’s junior team in the 2008 Under-19 World Cup in Kuala Lumpur. In the Semis there, Anderson, batting at No.6, scored a 67-ball 70 and of the 4 sixers – the first one was off Kohli. Earlier we have seen Chris Gayle hitting the cherry to all parts of the ground, especially in IPL. At Bangalore, against Pune, chasing a tall score Chris Gayle for RCB smashed eight sixes, including five in a row off leg-spinner Rahul Sharma – and one of them injured a spectator, a little girl who had come to watch the game. Later, Gayle visited the 10 year old girl in hospital, who had suffered bleed and fracture injuries in her nose. At a Press Conference later, he told that the girl told him not to be sad and keep hitting massive sixes. Now at NZ, it is not the Indian cricketers who made fortune… they are losing…. It was a simple catch ~ beyond the frontiers that made a man richer by Rs.52.16 lakhs….. a mouthwatering 1,00,000 NZ dollars. Jatinder Singh, a club-level cricketer, came into the windfall by winning a contest called: Catch a million. 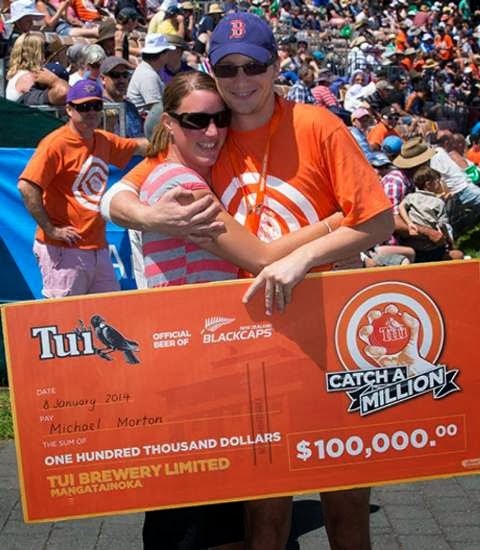 Promoted by Tui beer company, a spectator has to catch a six to win the initial cash award of NZ$ 1,00,000; he can then go to the next international match and win once again, if he is lucky enough. Jatinder was lucky enough to be there and smart enough to get up under that massive Anderson hit and catch it single handed. He jumped wildly when he realised that the ball stuck to his hand, and spectators around him joined in the celebrations. “I don’t know what I will do with the money,” he said. “Maybe buy a new car. I am sick of my old one,” he added. Corey Anderson flashed a big smile when he figured that he had made somebody rich, surely aware that 20 days later, it would be his turn. In Kiwiland, as a proud sponsor of New Zealand Cricket, Tui Brewery has made sure there’s as much action in the stands as on the pitch with Tui Catch a Million. For the 2013/14 season, Tui is giving cricket fans the chance to win a share of over one million dollars by wearing a special Tui t-shirt to the game – with the juicy orange carrot of winning $100,000 if they manage a one-handed catch in the crowd. The result has been a sea of Tui orange at grounds and the first one-handed winner, Michael Morton in Hamilton on Jan 8th 2014 quickly followed by Jatinder now. Says William Papesch, Tui Marketing Manager: “Tui knows the occasion of watching cricket is as important as the game itself, and Kiwis don’t need much motivation to make things interesting in the stands. Still, a hundred grand gets the boys together pretty quickly, and the response has been phenomenal. This is a great collaboration with our agency partners - we're all thrilled to see the campaign in action and really galvanise not just the cricketing community, but the nation.” The promotion has captured the imagination of commentators, players, punters and media, with the first catch generating huge social media coverage and international news.